OK, so we don’t do this very often. I mean, Dan and I could fill an entire separate blog with BBQ techniques and recipes. But a departure from your normal Lehigh Valley Professional Sports talk because several people have asked me for this recipe and I want to be able to just link to it rather than forward it over and over. I’ll grill or smoke most anything. There are several advantages to cooking your turkey outside on the smoker rather than in the oven. The chief of which is that the oven is now free to be used for side dishes and pies and other things while the turkey cooks outside. You’ll discover the other advantages later. So in 2009 I did some experimentation and some research and I wrote this recipe myself. I’ve done at least one turkey with it every Thanksgiving since, and never had a major problem or complaint (knocks wood). Of course you can alter it if you want, but I’ll add caution below where I think you should beware. I did submit this to a couple web site contests and such and won some minor awards and no money. I could no longer find evidence of that, though, so I’m re-writing it here. I use smokers by a company called Hasty Bake from Oklahoma. They are expensive and not widely distributed on the East Coast. You can use whatever smoker you’re comfortable with, of course–just make sure the turkey will fit! The injector I use is Cajun Injector by Bruce Foods. I got it at Wegman’s. Apple wood chips or chunks from Wal Mart. Royal Oak natural lump charcoal from Wal Mart. Disposable foil pan from Weis. Whisk together injection ingredients other than butter: apple juice, honey, wine, cajun and garlic powder. Use a little salt and pepper to taste. Transfer to sauce pan over very low heat and add butter to melt. Stir occasionally while prepping Turkey. Set up smoker with plenty of charcoal and deflector plate in place. Thermometers can be variable on smokers; you want something in the “medium” range for smoking or indirect cooking. Rinse and dry turkey, and remove neck and giblet pack for other use. Sprinkle inside of neck and body cavity with salt and pepper and poultry seasoning. Very Coarsely chop onion, apple, and celery and stuff cavities as much as possible. Truss or close cavities as desired. Once butter has melted, stir well to make sure all injection ingredients are combined as well as possible. Inject the breasts, legs and thighs until all fluid has been used, taking care to make as few punctures as possible. You can do this right in the foil pan if you like. Place turkey in foil pan coated with cooking oil or spray. Lightly coat turkey with vegetable oil, and sprinkle with white pepper. Handle pan carefully, supporting the bottom as you transfer to smoker. Add several wood chips soaked in water, or one wood chunk, to the fire box. Place turkey in center of grill and close lid. Do not open lid for two hours. If you are tempted to peek, instead just shoot yourself in the foot with the hand gun. If someone else tries to lift lid, shoot him or her in the foot with the hand gun. You’ll probably need to feed fire box at one hour with more charcoal and a very small amount of wood chips or chunk. Drink the rest of the wine. After two hours, open lid and rotate bird 180 degrees. You can foil the bird now if the skin looks too dark for you, or not. Feed firebox again as needed. After the third hour, you can cover with foil if you haven’t already. If you’ve been maintaining excellent temperatures, you can start to check with an instant-read meat thermometer. Be careful not to make too many punctures, though. Historically, I’ve pulled most of them after four hours, but cooking time can be very variable depending on many factors, chief among them turkey size, fire temperature, and ambient temperature. We’re aiming for 165 degrees for the meat. I often pull at 155-160 because the turkey will continue to “cook” itself during the resting time. 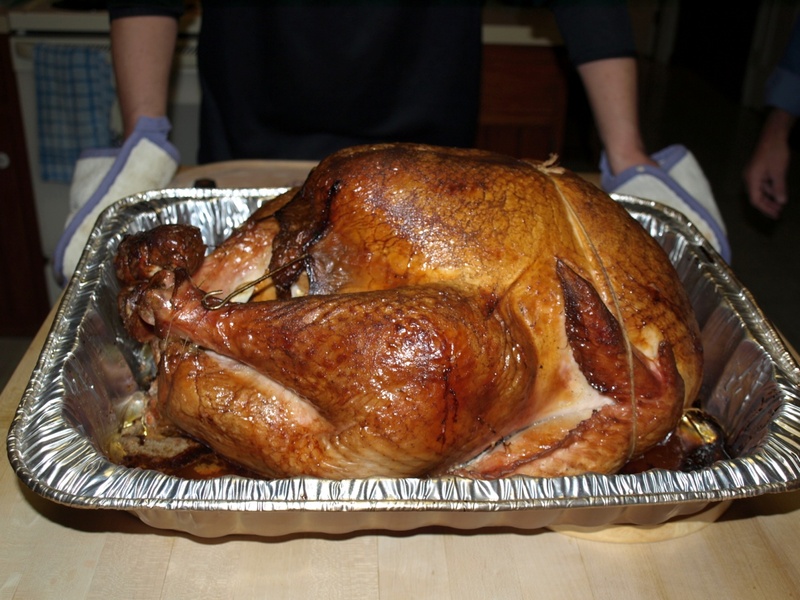 Keep foil over bird and let rest for 30 minutes before carving. Finish the side dishes and start getting the stuff on the table while you wait. Yes, that’s me in the background of the picture above. I like apple juice better than cider because it’s a bit sweeter and I like that effect on the bird. I’ll use a mixture of 1/3 apple juice, 1/3 wine and 1/3 water in a drip pan in the smoker, as well. You can use any white wine, but I like Riesling here. I’ll usually use a Washington state version such as Hogue. Be very careful to resist the temptation to over-spice or over-smoke. You might like those flavors, but they might not meld with the rest of the dinner. Also, Grandma Ellie and Aunt Bess might fuss about it. I’ve tried it before with this recipe–upping the cajun spice and upping the smoke. The results were fine for a June BBQ, but not for Thanksgiving. There might be a large amount of fluid in the pan by the time you’re done. If necessary, just lift the bird out by its trussing or use “bear paws” to transfer to a warm platter. Make sure grill temp is all the way up to where you want it before putting the turkey on. Struggling all day to get the temp up is a real challenge which can be somewhat prevented by starting off on the right foot. You can’t really add wood to raise the temp because it’s too much smoke. A windy cold day will also slow you down a bit so make sure you get started in a good place. The warm to hot injection fluid helps get the meat warmed up out of the refrigerator. Even if you miss the spot where you should have put the foil on, and the skin gets dark, don’t worry. The meat will still be excellent. The “stuffing” is an aromatic, and not meant to be consumed. Discard at the end or boil with the carcass to make stock if you’re up to it. I usually just cut the celery in thirds and the onion and apple in fourths. Butter, honey, wine and apple juice. Resist the urge to drink the marinade. Thanks. I was kidding about the gun. Kinda. Fluid will gush out of the bird if you’re poking it too many times with the injector or with the thermometer. Use caution. If placing a remote thermometer, consider gravity when choosing where to place it. You’ll need to be outside to man the grill, even if you’re not opening the top. Resist the urge to go in the house and help with other dinner preparation tasks. Get a comfortable chair and keep warm. Have someone bring you hors d’oeuvres and beverages. Get a small TV to monitor the football game. Do not leave your post; that grill needs guarding! Have fun, happy smoking, and HAPPY THANKSGIVING! The Horn & Bell’s Award Winning Staff! Subscribe to The Horn & Bell!